The flooded Georgia river bottom made hunting difficult for hogs and turkeys, but the author’s wading antics yielded a full cooler of fresh pork. Water in the flooded Georgia timber was rising rapidly when my buddy and I exchanged we-need-to-get-the-heck-out-of-here glances. We’d already made the ill-advised decision to wade through hip-deep water in a few places just to reach the enclosed blind, constantly on the lookout for snakes and gators. It had been a difficult hog and turkey hunt. He’d knocked down a gobbler early in the hunt, but I had nothing to show for hours of hunting. Obviously, I didn’t want to go home empty-handed, but there we were, facing the reality of a pork-less hunt. 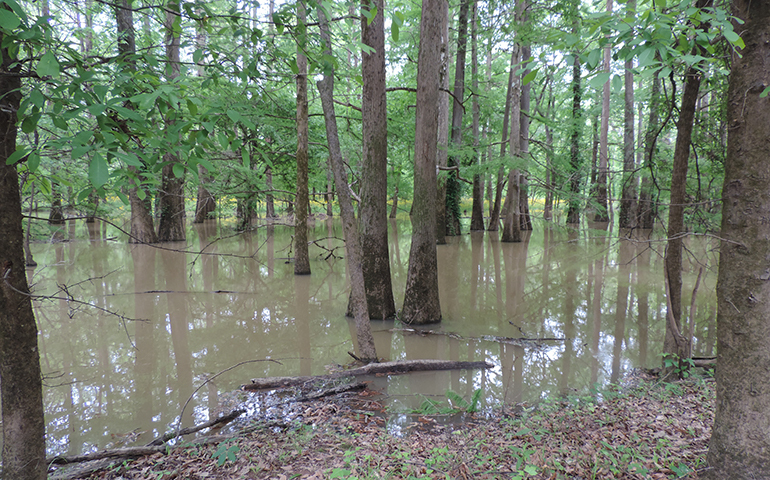 As we climbed down the stand and pushed through the flooded timber toward our ATV, we encountered waist-deep water in several places. Just as we reached a non-submerged portion of the ATV trail, I spotted a boar hog milling around in ankle-deep water, his snout foraging through the water like a vacuum cleaner. I believe God put the hog there as a reward for our efforts. I rolled to one knee to stabilize my rifle, but the hog instantly fed behind a tree. I sprang to my feet and hustled directly at the tree, then knelt as he fed out from behind it. At 40-some yards, it was a chip shot. I knew blood trailing would be futile given the amount of water and rainfall, so I settled the crosshairs on his cone. The Remington .22.-250 barked across the water through the flooded timber, and the hog crumpled in the water, cannon-ball ripples fleeing from his lifeless form. It was a thriller of an ending to an extremely difficult hunt. I live in Wisconsin where winter and its cold temps extend into late March, April and occasionally early May. Naturally, nothing sounds more inviting than a hunting trip to locations where green grass and spring flowers grace the landscape during these months. Plus, long hours spent writing all winter invites a time of R&R. Three species that come to mind are turkeys, wild hogs and black bears. Let’s look into some logistics and tips for chasing these species on your next spring road trip. 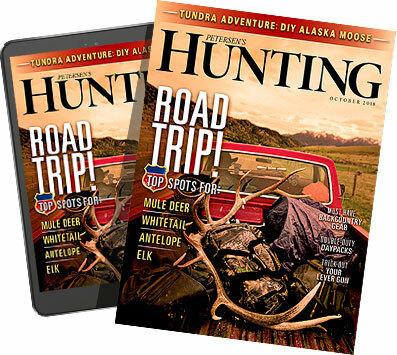 I’ve traveled to hunt turkeys in Kansas, Florida, Nebraska and South Dakota. And while I can get my fill of turkeys in Wisconsin, there’s something reinvigorating about chasing birds in new places. Choosing a location depends on what you hope to accomplish. When I hunt Florida, I combine beach time with my hunt. When I hunt the prairies and Great Plains, I hunt shed antlers during down time or once I’ve tagged out. I also look for new deer-hunting ground while hunting on public land. I combine other activities with a turkey trip because a 10-plus-hour drive is a long way to go for a turkey. Timing is key for the public-land hunter. Most places are best hunted on opening day before birds get educated, although I’ve had quick public-land hunts in May, too. Keep in mind that Kansas, Nebraska and South Dakota have archery-only seasons that open before the general/shotgun seasons. This is a great time to hunt large flocks of uneducated birds. Author Darron McDougal dropped this Osceola gobbler in central Floridain March 2016. On the prairies and plains, the best tips I can provide are to call loudly, use optics and be mobile. Last spring while hunting in South Dakota, I heard birds gobbling way off in the distance. I called with all the volume my box call could muster, and the birds answered. I scanned the rolling hills with my binos, and I spotted three dark dots. My rangefinder read 1,000 yards to the redheads. I continued calling, and they came on a string all the way to my decoys. Florida is its own animal. Osceola turkeys are the most sought-after wild turkey subspecies among those looking to complete their Wild Turkey Grand Slams. And, Florida is a populous state. Public lands are mobbed with resident and nonresident pressure. 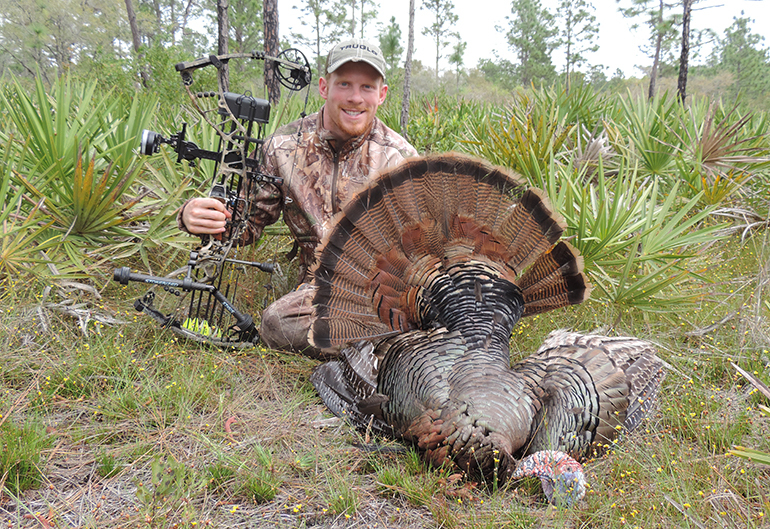 Your best bets are to hire a guide or apply for Florida’s quota hunts or Special Opportunity Hunts. Get-It-Done Tip: Turkeys are turkeys, regardless of location. Use cover and terrain to make moves on birds. From there, use your calls and decoys wisely and only when it makes sense. The South is overpopulated with feral hogs. Licenses are either inexpensive or not required (check regulations for the state you choose to hunt), and bag limits are either generous or nonexistent. These suckers reproduce faster than hunters can kill them, hence the light regulations and hefty bag limits. Some states even allow night hunting with lights. I’ve killed hogs in Florida and Georgia. Private land is best. I witnessed lots of sign on public land in Florida, but hogs are heavily hunted and I didn’t see any. After scoring permission to hunt on private property, I killed one right away with my bow. If you have limited time to hunt, I highly suggest seeking permission on private land. Networking is a great way to generate hog-hunting leads. 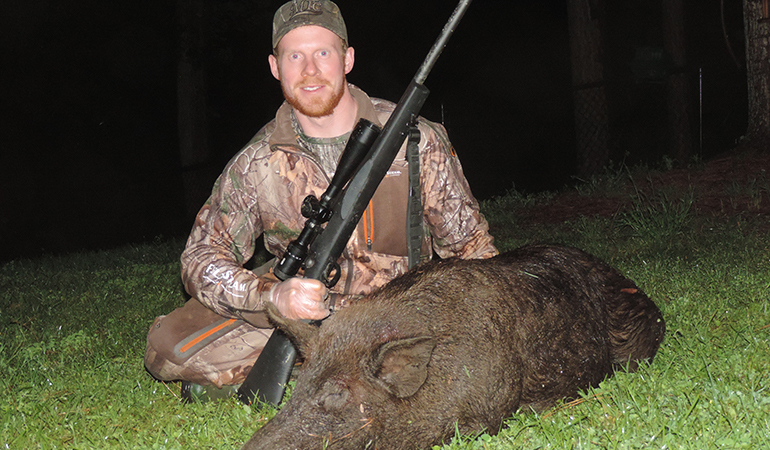 Often, you can pay little or nothing, or you can trade a deer or turkey hunt in your home state for a hog hunt in the South. The flooded Georgia river bottom made hunting difficult for hogs andturkeys, but the author’s wading antics yielded a full cooler of fresh pork. Hogs roam a broad scope of habitat, but it seems they prefer wet, shaded or swampy habitat during the midday heat. In the evenings and mornings, they meander through oak hammocks or along field edges. You’ll likely encounter wallows where they roll in the mud, and you’ll also find tilled-up ground where they’ve been digging. Get-It-Done Tip: Hogs are tough, and shot placement is everything. Extensively study anatomy charts online prior to hunting them, especially if you’re hunting with archery tackle. I have friends who’ve killed spring black bears in Idaho and Montana. This hunt will be the most expensive on this list but still affordable for most. Once bruins evacuate their winter dens, food is king. Black bears are often thought to be carnivores. However, they are omnivores and will eat grasses just as readily as a calf elk or fawn deer. Thus, south-facing avalanche chutes are great places to search for bears grazing on tender shoots. Once a bear of interest is spotted, the stalk is on. Keep the wind in your face as you move in for a shot. Baiting is allowed in Idaho (study the regulations for specifics/restrictions), so a hunter with more than a week and some tasty bait can realistically orchestrate a successful hunt from a treestand over expired bakery. Understand that grizzly and black bear habitat overlap in many parts of Idaho and Montana. Pack bear spray and a sidearm (know the regulations, here, too), and don’t walk into the timber until daylight. Get-It-Done Tip: Being successful at spring bear hunting requires more forethought than turkeys or hogs. These are reclusive big game animals, so it’ll be a challenging hunt in tough terrain. You’ll need to be in great shape, have extensive maps denoting National Forest access and be prepared for long days behind glass. Spring, without question, is an exciting time to be a hunter. Adventure is out there just waiting to be had. But, to have an enjoyable experience, the planning must begin now or already be in the works. Also, if you’re on a budget, look for ways to cut costs. For example, can you camp rather than pay motel fees? Better yet, can you stay with a friend or family member who lives in the area? Rough it by eating sandwiches rather than dining out each evening. Process your own meat. For the turkey hunt, drive a gas miser rather than your pickup truck. Creativity goes great lengths toward saving money. Choose a species and location from the list above, and start working out the details right now. Then, embark on a thriller spring adventure you’ll never forget.